Die hard gold vinyl version with 3mm jacket, insert, sticker, and TS. ANY ORDER THAT INCLUDES THIS PRODUCT WILL BE SENT ON NOVEMBER 18TH. It has been over twenty-four years since the original Xibalba released its first album, “Ah Dzam Poop Ek,” in 1994. Since then, this unique cult of Mayan black metal has survived an extended period of inactivity and has more recently released a series of shorter recordings that merely served to whet its audience’s appetite for something more complete. Throughout this time, Nuclear War Now! has demonstrated its admiration and offered its support by reissuing the aforementioned debut full-length and “Ancients” demos compilation on vinyl, in addition to releasing the band’s “Demo 2010” cassette and “Ah Tza!” EP from 2015. 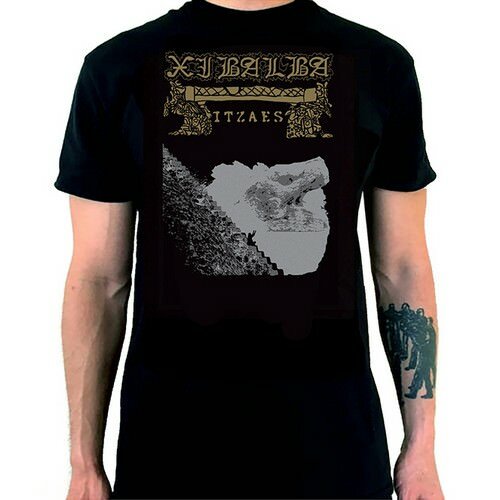 However, it has taken nearly a quarter century to release its second full-length, “Ah Tza Xibalba Itzaes,” which is hereby also presented by NWN!, albeit under the revised band moniker of Xibalba Itzaes. This change in name, although potentially misleading, was deemed necessary to distinguish itself from another band who had either callously or ignorantly assumed the same title in recent years. 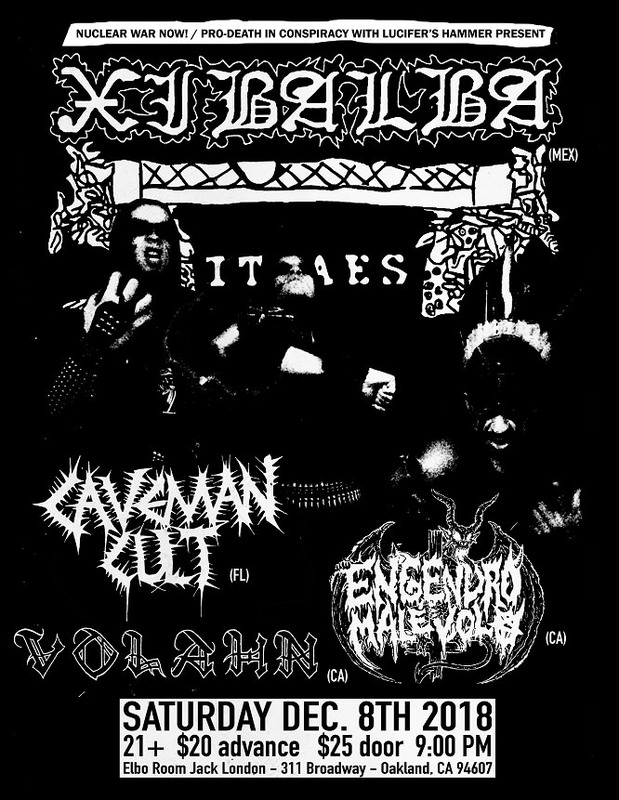 As with previous recordings, “Ah Tza Xibalba Itzaes” combines the more commonly-recognized elements of black metal pioneered by the band’s early influences, such as Bathory, with others inspired by the pre-Hispanic traditions of the members’ Mayan ancestors. The resulting sound is one that has made the band one of the most unique black metal bands to have hailed from present-day Mexico. 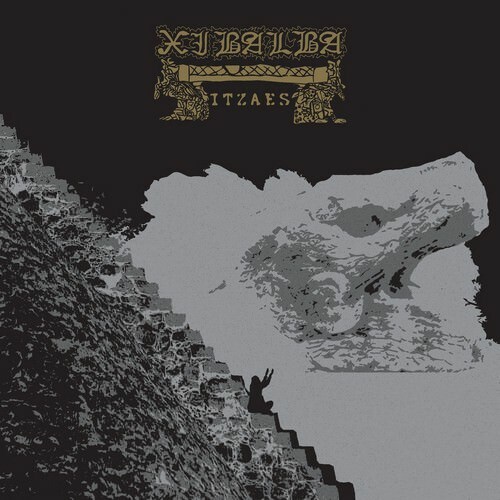 “Ah Tza Xibalba Itzaes” is comprised of a total of twelve tracks, of which eight are completely new and four are re-recorded songs that originally appeared on the preceding EPs and 2010 demo. The album’s production is sharp and cutting with only relatively light usage of varying effects (other than distortion), which is a refreshing contrast to those who rely on a shroud of reverb and delay to create an atmosphere that obscures the instruments themselves. Xibalba Itzaes’ connection to their cultural heritage is evident in the themes explored throughout, which include regular references to Mayan deities and related apocalyptic folklore. As such, “Ah Tza Xibalba Itzaes” hails the return of the warriors of the Mesoamerican black metal underworld and the Mayan death gods who spawned them and whose spirit they revere. Ordered. Had to get a die hard as that t shirt is killer. Cant wait to hear this full record! I'll post better photos when the gold LPs are back. Been listening to this for the past few days. What a great and unique band. Definitely one of my favorite albums this year. Bands like this remind me why I listen to black metal. Sounds too modern for me. Yeah, and I am not sure whether I like it or not. Have to give it a deeper listen, I think. I'm thinking of some fucked up '90s black metal productions with that clunky, digital sound... in a good way! The two songs I heard were great, will save the rest for the record later. I'm really enjoying this album. It just seems to have hit me a lot better than any of the previous Xibalba releases....only problem is it just seems too short! I guess any album that leaves you wanting more isn't the worst thing in the world though. I'll have these for sale at the gig. This album is really excellent. Something to check out if you havn't already.